Of course it's better, Huawei. 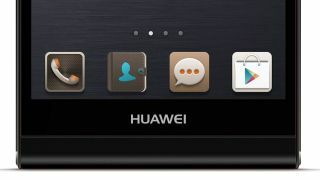 Huawei's CEO told has told TechRadar that it could offer stock Android with its new Ascend P6, but doesn't think it would benefit consumers. With the Samsung Galaxy S4 and the HTC One both being offered with a stripped down, native Android experience, we asked Huawei's Consumer Business Group CEO Richard Yu whether Huawei would follow suit for the world's slimmest smartphone, offering an option that removes its own custom skin on top of Android 4.2 that is currently running on the P6. "We can provide an original Android OS, but we find people like our Emotion UI more as it's more simple and easy to use," he said. "It's also more interesting [than stock android] as well as more customisable, allowing us to connect more easily to people's emotions." When asked if Huawei would consider allowing it as an option, Yu reiterated that Huawei had looked as such an option, but said "more people like Emotion UI – our consumer surveys have told us this, that they like this kind of functionality." "We've made several hundred improvements to the Android OS, we can bring a lot of value to customers, such as improving background running, [the way the phones] use data and battery consumption," said Yu. "Apple make simple, easy to use products that are very successful – even kids can use and iPhone and iPad. We are leaning from them; we try to improve our Android OS but our competitors never sleep, so we have to keep improving to do better than them." The debate over whether phone manufacturers should be offering a stripped-down native version of Google's Android phone rages on, and will only grow in volume from the small portion of smartphone fans that prefer the choice to remove device-native user interfaces, such as Huawei's Emotion UI. Given the relatively low market share Huawei currently enjoys, it would also be a boon for the company to be one of the few to offer the 'Nexus' native Android experience, not least because the hardware alone would attract a number of users. However, Yu's point is strong: Huawei has made a phone to cater for those that want a powerful experience, as well as stamping the company's brand onto the market through the UI. Whether many will like the loss of the app tray is another question for debate, but there's no doubt that adding the option for stock Android on the phone would add another layer of complexity to a phone that is being sold as 'accessible'.